Looks like a pretty idyllic place, if it weren't for the dangerous predators, deadly virus, freezing nights, etc. 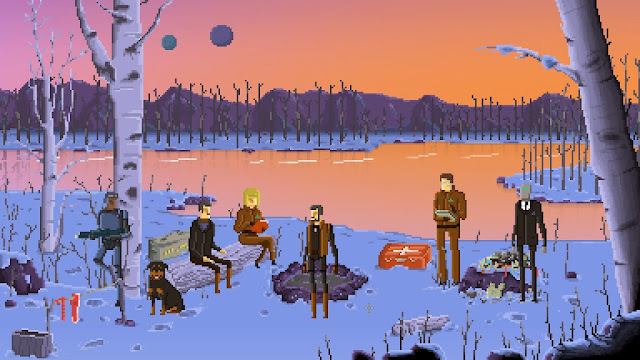 Gods Will Be Watching is another game I managed to grab from the Steam sale and one that I've already invested a couple of hours into. Despite the game receiving mixed reviews from Steam players and Metacritic, I was curious to see how the game worked since I'm into point 'n' click choose-your-own-adventure style games with ethical dilemmas and the developers advertise the game as ticking all these boxes. So what's good about the game and what's not so good? Ethical dilemmas: The game delivers these in spades and you'll always be facing life or death situations ranging from hostage situations, torture and surviving on an alien world. Edge of your seat gameplay: Despite the game being a game that you can play at your own pace, and navigated by text boxes and menus, the game is quite competent at making you feel tense. You're always wondering what disaster will surface next and wondering if that teammate you were talking to yesterday might be the last time you ever see him/her again. Stats at the end of a chapter, Telltale Games style: Just like the recent crop of Telltale Games like The Walking Dead or The Wolf Among Us, at the end of each chapter you're shown some interesting statistics with respect to the choices other players made. Did most players manage to save everybody? Or did they sacrifice almost everyone? These are the kind of questions that will be answered at the end of each chapter. Mouse-driven gameplay: The developers advertise this game as a "point 'and click thriller" and they're absolutely right in that regard. For those who love games where you don't need to perform "Quick Time Events" or players who prefer to just use one hand when playing games, Gods Will Be Watching is one of those games. Difficulty: The game is meant to be difficult - I know. However, you don't realise how difficult it is until you play the "Original" difficulty mode. I spent half an hour replaying the very first chapter multiple times before I eventually gave up and reverted to Original - Light mode. This thankfully seems to be the right difficulty for me (so far) but we shall see. Stuffing up means having to restart the entire level again: This is related to my earlier point about difficulty since by forcing players to restart the level again you're making the game that extra bit difficult but also annoying since some actions fail due to bad luck (at least on the Original Modes). Sometimes cannot skip chapter intros: In the first chapter, you're at least given the choice of holding the right mouse button down in order to skip the intro (as if you're going to be failing the chapter a lot, it'll get pretty annoying otherwise). Unfortunately that didn't seem to be the case in the third chapter - I'm not sure why. Some typos: For a game that is heavily reliant on text you'd expect there to be a minimal number of typos and spelling mistakes - but there seems to be quite a few in this game. I'll definitely be aiming to finish this game since there are way too many questions left unanswered for me to stop now. Thankfully, the current difficulty I'm on seems to strike a happy balance between frustratingly difficult and mind-numbingly easy. Only then will I know if all the struggles were in vain or whether the conclusion is one that's worthwhile.